But that’s about to change. 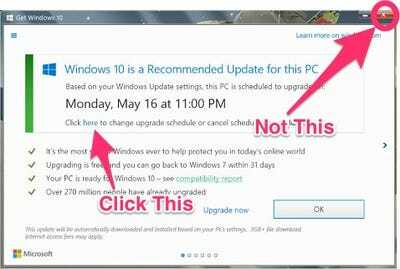 In the wake of customer complaints that these upgrade notices are confusing and irksome (in one case, a Windows 10 upgrade alert famously interrupted a live TV newscast), Microsoft is rolling out a new, friendlier notification, the Wall Street Journal reported Tuesday. to schedule the upgrade automatically. $10,000, claiming that her computer upgraded to Windows 10 without her permission, leading to all sorts of technical problems that stalled her business. Microsoft’s new upgrade prompt will provide three, clear-cut options to choose from: “upgrade now,” “choose time” and “decline free offer.” This time around, clicking the “X” will dismiss the notification, at least for a few days. Clicking “decline free offer” will permanently disable the notification from ever surfacing again. Microsoft’s push to convert Windows 7 and Windows 8 users to convert to Windows 10 is an attempt to unify their userbase. On July 30, Microsoft will start charging $199 for its Windows 10 upgrade. But, until then, the persistent, albeit softer, notifications will remain.